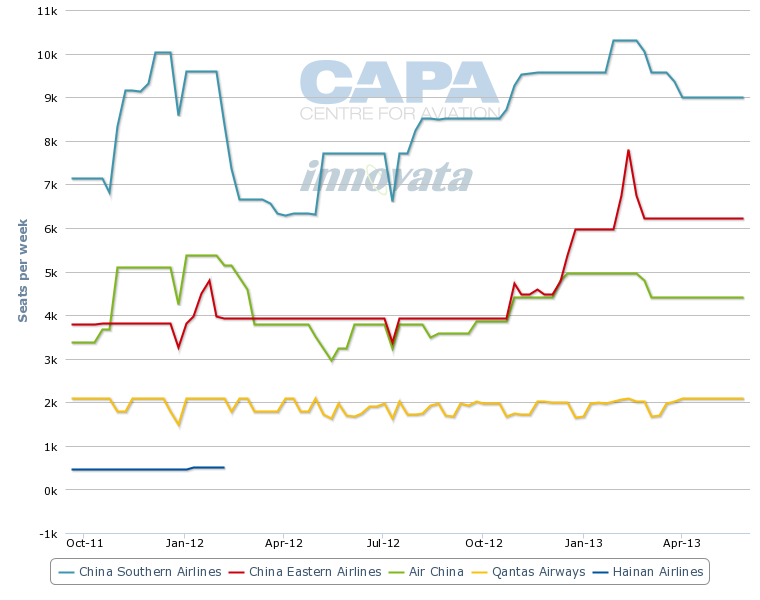 Qantas & Virgin Australia look for new Asian partners: China Eastern for Qantas, Cathay for Virgin? Qantas and China Eastern are nudging each other for a deeper partnership to cover Australia-China traffic flows. Feelings are warm on both sides; all that is missing is the time and resources to complete a deal. Qantas is busy with its Emirates partnership as well as continuing network improvements, including its loss-making international network, while China Eastern is a slower moving company and concentrating on its own rapid expansion. The two of course are also busy with their joint venture LCC, Jetstar Hong Kong. Their thunder may be stolen by a more agile Virgin Australia, which has set as its next strategic development a partnership with another Asian carrier – and one most likely to be in North Asia to facilitate better connections around the region than Virgin can achieve with its Asian partner Singapore Airlines. Cathay Pacific could be a strong partner for Virgin: besides network synergies, they both share a common competitor in Qantas. A stumbling block is that Cathay and Qantas are both members of oneworld, but Cathay is an ambivalent member, and either way global marketing alliances are losing muster as partnership dynamics revert to a bilateral focus. A mere few years ago Qantas and China Eastern would have seen their presence between Australia and China as one between competitors. Although the two have limited codesharing, mainly within China and Australia, they have not consistently partnered between China and Australia. But a few years is all that it takes to change market dynamics in aviation. China Southern has emerged as an aggressive competitor, wanting to operate 55 weekly flights between China and Australia/New Zealand by 2015. In 2009 it had a mere seven weekly services. China Eastern and Qantas have their own unique competitive attributes that will see them take a lesser role in the Australia-China market than China Southern. Qantas as an end of line carrier is disadvantaged when it comes to traffic distribution in a market that is still growing. It is further disadvantaged by its high cost base. China Eastern meanwhile is playing catch up after spending much of the latter part of the last decade on its time consuming merger with Shanghai Airlines. During that time China Eastern fell behind on international expansion, a situation further worsened by delays to the 787, which China Eastern was planning to use to spearhead international expansion. Subsequent delays, and performance issues that reportedly prevented China Eastern from profitably operating 787s to the US east coast, saw China Eastern cancel its 787 order and instead purchase additional A330s and new 777-300ERs, still some years away. China Eastern, watching China Southern's rapid expansion despite declining yields, has since become cautious of expanding in Australia and Europe, China Southern's target markets, and is instead looking at North America. Its cautious strategy is permitting the Dec-2012 launch of Nanjing-Sydney services, supplementing its services to Melbourne and Sydney (China Southern also serves Auckland, Brisbane and Perth). The new world order of aviation involves partnering strategically to make yourself bigger than competitors. Individually, China Eastern and Qantas are the smallest players in the Australia-China market, but combined would represent 32% of capacity based on Dec-2012 capacity, making them a formidable opponent to China Southern's 45% share. Air China accounts for the remaining 23%. 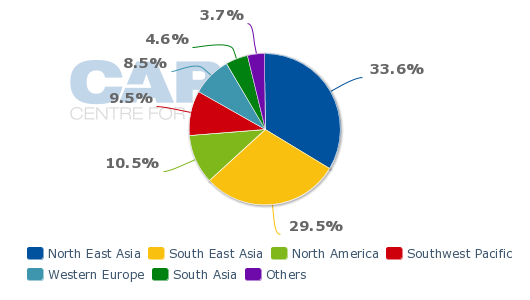 China Eastern's forthcoming expansion would see a combined China Eastern-Qantas presence account for 38% of capacity. Any tie-up between Qantas and China Eastern would also make them more competitive towards the elephant and fiercer competitor in the Australia-Asia market, Cathay Pacific. Its equity partner Air China is equally weighty in China. A number of partnerships are forming to counter the combined strength of Air China and Cathay. It is not just sheer scale that a Qantas-China Eastern relationship would deliver (likely starting as a deep codeshare and frequent flyer arrangement, and progressively expanding). There would be network benefits to both sides. China generally operates on a one route, one airline policy that sees international sectors limited to having one Chinese carrier on them, a policy designed to limit competition against Chinese carriers and instead let them build experience against international carriers. The exception to this rule, to the chagrin of peers, is Air China. Although Air China, China Eastern and China Southern are all state-owned, Air China is the flagship, the government-preferred carrier that curries considerable favour in the power halls of Beijing, its base. The administrator of China's airline regulatory body, the CAAC, is a former Air China chairman. Air China is allowed to fly on routes already occupied by competitors, such as Shanghai-Sydney, which China Eastern serves. But in turn, China Eastern is not permitted to fly between Beijing and Sydney. The result is Air China has a wider spread for non-stop flights, serving Sydney from both Beijing and Shanghai. China Eastern will not be able to fly to Australia from Beijing, save for secondary Australian cities Air China does not serve and would not object to China Eastern serving. Partnering with Qantas, however, gives China Eastern a friend that is unrestricted in its Chinese ports. Qantas had previously operated a Sydney-Beijing service but culled it in 2009; with feed from China Eastern, that service could be sustainable again. Qantas' sole passenger service into mainland China is a daily Sydney-Shanghai service. In 2009 Qantas ended a Melbourne-Shanghai service. 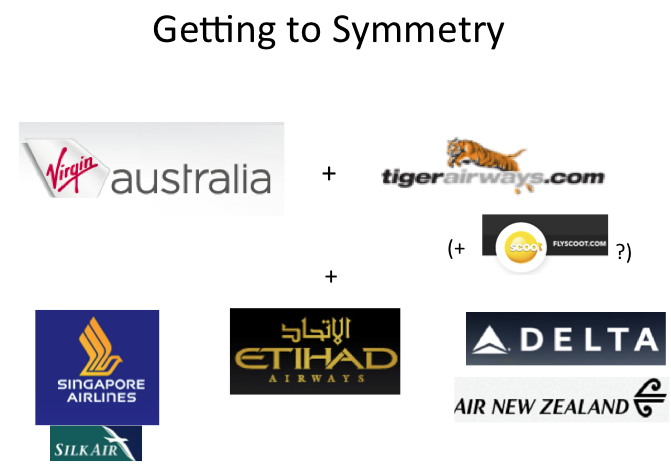 And of course there are the regular benefits from a tie-up: greater connections in home markets, combination of each other's frequent flyer programme members, reciprocal lounge access and the like. The current Qantas-China Eastern relationship sees Qantas codeshare on China Eastern domestic services between Shanghai and Beijing, Chengdu, Dalian, Fuzhou, Guangzhou, Harbin, Kunming, Qingtao, Shenyang and Xian and also between Shanghai and Singapore. In turn, China Eastern codeshares on Qantas services including: 11 Australian domestic routes; five trans-Tasman routes; and between Singapore and Sydney, Melbourne, Brisbane, Perth and Adelaide. A longer term opportunity could be Qantas services from China to Europe. 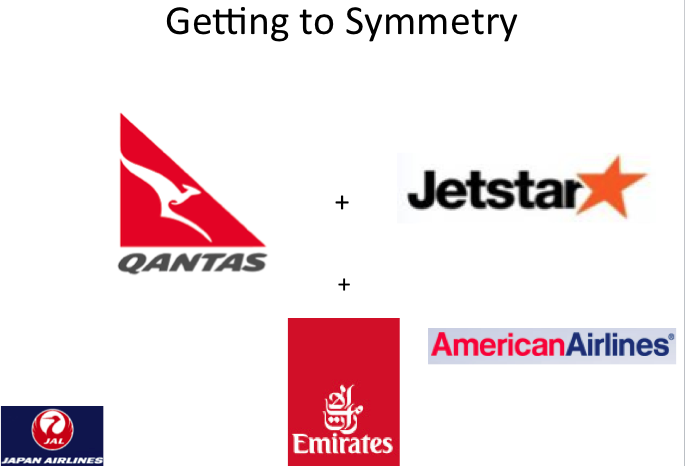 Chief executive Alan Joyce spoke of this possibility in 2010 (Qantas has fifth freedom rights from the Chinese but not yet under European bilaterals), well before Qantas elected to move its European stopover hub from Singapore to Dubai in partnership with Emirates. Given the growth trajectory of China, and Shanghai being a far more attractive destination for Australian interests (leisure and business), this should not be ruled out for the long-term. In early 2013 Qantas is due to make announcements regarding its enhanced position in Asia. While more far-reaching possibiilities like opening (or resuming) service to new cities has been discussed in local reports, what is certain is Qantas will re-time flights to Hong Kong; they all currently arrive in the evening and limit same-day connection opportunities. (Re-timing will help Qantas do away with the daily 22 hour layover one of its A330s has in Hong Kong.) Qantas has mentioned hoping to expand its relationship with Dragonair (currently confined to non-codeshare commercial arrangements), the full-service subsidiary of Cathay Pacific focused on regional Asia, and China in particular. Dragonair is the largest non-mainland Chinese carrier in China. Cathay will no doubt will want to keep such an arrangement at arm's length since it would prefer to carry Australia-China passengers for their entire journey than let Qantas carry them on one segment. Any further Qantas-Dragonair relationship may therefore be time limited. Dragonair's network is relatively extensive, serving 19 Chinese airports from Hong Kong. But China Eastern's hub in Shanghai is larger, serving 31 cities from Pudong, the main international airport of Shanghai (Hongqiao is primarily domestic). China Eastern also has more capacity on top routes than Dragonair. China Eastern serves a further 40 international destinations from Pudong. Hong Kong airport may have better facilities and visa arrangements, but this is changing. SkyTeam, in which China Eastern is a member, is working to help its Chinese members improve their offering, including lounges. Visa restrictions are loosening, with Shanghai in Dec-2012 following Beijing's lead in permitting 72 hour visa-free transits. While Qantas and China Eastern work out their arrangement, Virgin Australia under transformational CEO John Borghetti has set as its next strategic goal a partnership with another Asian carrier, one most likely to be based in North Asia. Virgin's objective since Mr Borghetti took the reins was to secure two Asian partners, one in southern Asia and one in the north. The eventual selection of Singapore Airlines, with a wide network across North Asia as well as having one of the highest reputations in the world, meant that Virgin could put its north Asian partner on the backburner as it addressed other strategic developments. But the time to resume the hunt is now, apparently. While SIA and its hub at Singapore are ideal for Southeast Asia, India and Europe, they are not efficient for North Asia. Sydney to Beijing via Singapore is 15% longer than via Hong Kong, for example. Mr Borghetti's options are few: a partner too far north in Japan or Korea would involve backtracking for less-northerly destinations. Carriers there are also weaker in Australia, as are the Taiwanese carriers, which offer some better geography. Cathay Pacific, China Southern and perhaps Air China are the only viable candidates in North Asia, and the pick of these would undoubtedly be Cathay, with its immense network in Australia that Virgin could tap into overnight, as well as combination of network and geography, superior brand and recognition (qualities of which are especially important to the marketing-oriented Mr Borghetti), and frequent flyer network. Cathay will undoubtedly need coaxing, and a push to do the deal in the speedy and efficient manner Mr Borghetti has led Virgin Australia (one local media outlet termed him the "Italian stallion"). 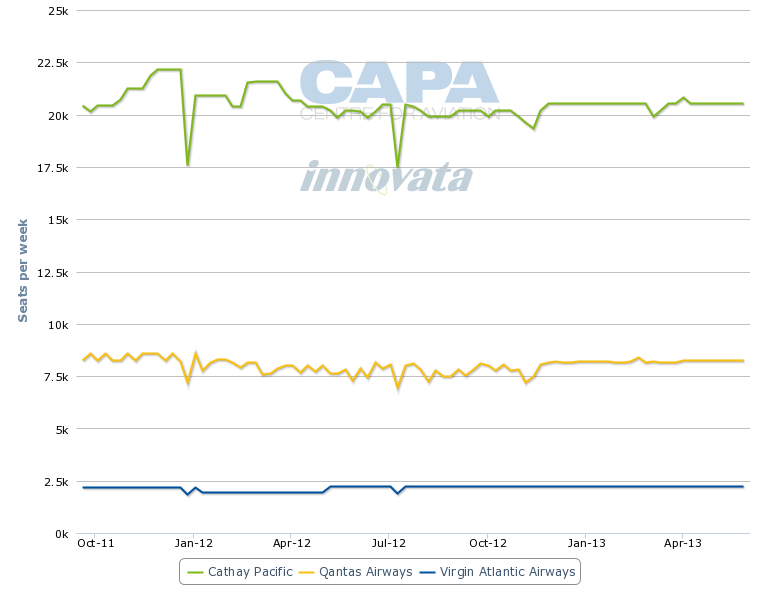 Cathay is highly independent, but the opportunities to compete against Qantas with Virgin as a partner are attractive. Plus Mr Borghetti has proved persuasive, forging a deal with SIA, which was previously independent as well but is now opening up. Cathay is showing some signs of cooperation following a deal with Air New Zealand, which coincidentally is a partner, strategically and financially, in Virgin Australia. The benefits to Cathay are numerous. 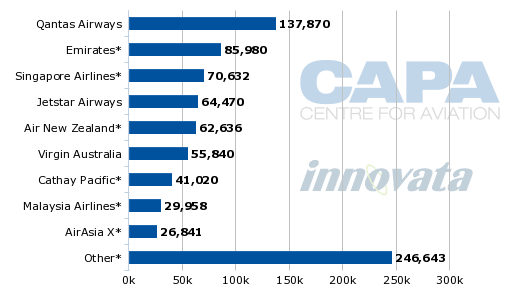 Australia is its largest long-haul market after North America. It will be able to tap into the domestic Australian market, which it never did with Qantas out of anti-competitive concerns, as well as general relations between the two carriers. In doing so, Cathay can better compete against Qantas – which it would be especially willing to do following Qantas' establishment of a LCC, Jetstar Hong Kong, in Cathay's hometown. A partnership with Virgin could also help Cathay to grow. Virgin has flagged interest in serving Asian business cities with its own metal, and Hong Kong has been a contender. Indeed, Virgin Australia, the then-international brand, in the early days of its operation (well before Mr Borghetti's time) went as far as to apply for slots in Hong Kong. Cathay Pacific has almost reached the limit of the amount of frequencies it can operate to Australia under the Australia-Hong Kong bilateral agreement. Australian carriers will be years away from using their full allotment, if ever they would. Hong Kong has approached Australia for expanded access, but Australia has requested it be given fifth freedom rights out of Hong Kong, which the SAR typically does not allow. No doubt Hong Kong and Cathay sense that Qantas could mount an aggressive organic growth campaign (instead of establishing new carriers) in Hong Kong if it were given the opportunity. Any bilateral expansion would be limited, and there is the chance fledging Hong Kong Airlines could secure rights to launch services to Sydney. So using the capacity at the disposal of Virgin would be welcome in the same way China Eastern could use the greater access of Qantas. There would need to be ring-fencing in any Virgin-Cathay deal, less for Virgin than for SIA and Cathay, which are deep competitors. But this does not need to be too imaginative. Then again, the opportunity for a partner to fill what would otherwise be an empty seat becomes tempting. Indeed, it is in filling incremental seats that the industry is slowly getting creative with. The downside to a Cathay-Virgin is the potential that Virgin may not be able to secure codeshare rights on Cathay's services into mainland China. Such third-country codeshares are up to governments to determine, and China generally does not approve them, although there are exceptions (airberlin recently secured approval to code on Etihad's China services). An itinerary with flights all having the same code are given preference in GDSs; Virgin is mounting an aggressive GDS campaign with its forthcoming switch to Sabre. Partnering with a mainland carrier does not raise this issue since domestic codeshares would be approved. Then again, third-country codeshares are ultimately up to Beijing's whim, and Cathay has a close relationship there. Unrelated partner Virgin Atlantic, which operates a daily Hong Kong-Sydney service, may appear an obvious link, but Virgin Australia and Virgin Atlantic have little in common, aside from a common name and equity interests from Sir Richard Branson. Management at each carrier has little to do with the other, as evidenced by the fact it took the two until mid-2011 to reach a codeshare agreement for the Hong Kong-Sydney service despite it being started mid-last decade. However that may change once Delta takes up its 49% holding in the UK carrier. Virgin Australia and Delta are very close and share a metal neutral partnership on the South Pacific routes. The prospective partner moves from Virgin and Qantas will further see each other mimic the other's strategy, domestically and internationally, from LCCs to relevant partners. Each Asian partner fits very neatly in strategies, but does not fit in the traditional view of being tied to the three global marketing alliances. But attitudes towards partnering are changing, and only a standout few such as Lufthansa are strictly adhering to a close, alliance-based relationship. As Virgin and Qantas continue to show, going outside a single alliance to form a "me-centric" alliance can deliver previously untapped benefits.